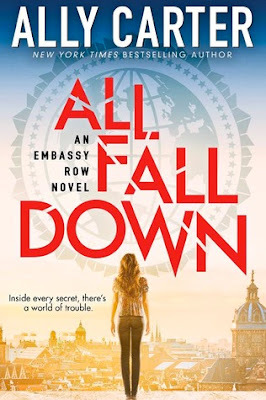 It’s been three years since Grace Blakely has been to the U.S. Embassy on Embassy Row in Adria. It’s been three years since Grace saw her mother murdered. It’s been three years since everyone decided that Grace went crazy. But Grace knows she isn’t crazy. No matter what anyone says about her mother’s death being an accident, she knows better. Because she saw her mother shot down, and she saw who did it. What’s worse, is her mother’s murderer is in Adria too, and Grace is going to make him pay, if it’s the last thing she does. I honestly can’t tell if I liked this book or not. All I know is that I definitely MUST read the next book before I make final judgements. Grace is the type of character that I’m not into personally. She kind of the self-righteous character that pushes everyone away, always assumes the worst, and might actually be crazy. It was hard for me to stay interested because of that. And… (has anyone read this?) The very last page, as in the last few sentences, throws down a crazy cliffhanger that has me totally confused and intrigued at the same time. Like, I’m suddenly not sure how to classify this book at all. This book is written for a younger YA audience. (Maybe 12-14 years old) I think it’s the perfect kind of book for the tween that’s looking for an older teen vibe, but still not ready for sexual content of any degree or swearing. It’s got almost zero romance in it (you get like, two romantic hugs) which was actually refreshing to me. It was so nice to concentrate on the plot and not a romance! The way this ended, it feels like a series you need to judge as a whole, and not by individual books. So even though I wasn’t a big fan of this per se, I’m intrigued enough to continue.